Welcome to the haunted hovels section of Haunted places in Oklahoma. Please select a link below to view information on that location. Cars have broken down frequently on this bridge, sometimes even school buses, but only at night. People claim to have seen a Native American man jumping off the bridge, also they have seen blood dripping onto the windshield as they drove over the bridge. Dead animals have also been reported to be seen hanging from the trees that overhang the bridge but they are nowhere to be seen when they stop to cut them down. A team of investigators began taking pictures over the bridge when suddenly, while they were reloading the film, a flash came from under the bridge as if something was mimicking their camera flash. It came from under both sides and it was gone almost as soon as it happened. They decided to drive forward about 15 feet and got out to see a bright ball of white light floating towards them, they described it as being almost like a flashlight going on and off zigzagging through the trees. It continued to come closer to them as they were taking pictures of it. They claim that the pictures came out quite nicely. This cafe is inside the old high schools gymnasium. There have been orbs are visible in pictures. Also people have reported hearing footsteps, voices, knocking on walls as part of an everyday occurrence. Reports also say that a headless woman appeared on Memorial Day,2002. She was thought to be that of young woman murdered and burned about 50 years ago. People have been able to smell burning hair on some days amongst some other odors. There has been a possible portal located in the hall. Being touched is also a regular occurance. This is a 19th Century Victorian mansion, that lies in the woods, far far outside of the town, perched on the top of a huge hill over looking the country side for miles. This house has been the scene for 4 deaths in the early 20th century. Since then the house has burned twice, now only the rock walls and foundation remain standing watch over the miles of lonely woods. If you make it through the mile of lush vegetation, to the top of the hill, reports of people that have ventured there say, they were generally treated by their flashlights not working, strange, invisible people shouting their name, odd smells, strange animals running through the dark, and only a few meters in front of them. But probably scariest part of the reports is when what's left of the fireplace starts to blaze on it's own as they left. Rumors say that the old farmhouse southeast of Blackwell was where the family Hollopeter used to reside. There used to be an old iron bridge there with the wooden floor that Mr. Hollopeter's daughter hung herself on. It is said that you can sometimes see the rope from which she hung herself still hanging on the bridge. Apparently, they left the rope hanging there for a long time after the suicide. It is also said that if you drive past the house at night, and you look up into the top of the barn, you'll see the grandmother sitting in her rocking chair feeding the chickens on the ground. Also, Mr. Hollopeter is said to have appeared on his white horse down in the bottom of the river, which is very shallow, when you honk your horn and flash your lights while sitting on the bridge. This area floods very badly, so the old bridge is no longer there, it was finally washed away about 3 years ago. About three miles down a gravel road (about 10miles away from civilization) there once stood a concrete house that was reportedly once owned by KKK members which has just recently been torn to the ground. Several reports have been made about bonfires seen one minute and then disappearing the next. Also of freezing cold temperatures inside the house even in the middle of summer. A sharp turn is located about feet from the rubble and at night there is a car that drives insanely fast around this turn and then will disappear into a nearby barbed wire fence out into a cornfield. No tire marks have ever been found. Staff have reported on numerous occasions that while they were closing the library in the evening several voices were heard in the southeastern corner of the building. They have been described as teenage or adult voices in heated arguments. Also heard were small children laughing and playing. During the time of hearing the voices they also reported feeling a cold chill in the air in that particular area of the building. There are reports of two ghosts inside Byng Auditorium. One of alittle girl who fell off the back of the 1st module (at Stage left). This ghost has been encountered by many late night drama students during rehersals. She has been said to sing "I dropped my dolly in the dirt" but she has never actually been sighted. The second an older drama graduate who went to become a model in 1973. "Sally," they have called her, was a perfectionist and didn't think she would make it so she committed suicide. There have been two people that have witnessed "Sally", but she is always seen backstage and only her profile is seen. Doors have locked, and on one account, a student was actually trapped within the room by an unknown and undescribable force. Things have been known to move and scratches and whispers have been heard. Many of the Drama students believe that it's "Sally" trying to make herself known once and for all. At about 1989, the Station's Program Director sadly passed away of a heart attack early one Saturday morning on the couch in the station lobby.There were two DJ's in the building at the time of his death. Weeks later, staff members who were locking up by the parking lot reported seeing this deceased Program Director peering at them out of the darkened window of his old office on the second floor. He has only been seen a couple of times thereafter. The station was relocated in the mid-nineties to a different building on the campus. The old radio station (KNGX) has been torn down. It is possible that they have dorms or classrooms on the site now. KRSC radio 91.3FM now shares a building with the College TV station. Several years ago Drumright High School was a bomb shelter. Late at night or during a bad storm when lights go out people have reported to have seen a ghostly figure of a soldier walking up and down the hallways. They said that if they stared at the soldier long enough he turned and looked at them before disappearing. There are many places in the school that have now been blocked off and the school will not say why. There are still tunnels that are under the school that lead to many other places in the town, but they have been closed off. Nobody wants to explain the mysterious things that happen in the school. Shear Hall the dormitory, that is one of the football dormitorys, there have been reports of a ghost on the 3rd floor. But it is completely locked up, so no one is able to get up there unless they have a key. It is rumored that a young student went crazy and shot several people then turned the gun on himself. Today students who live there say that sometimes they have heard things sliding across the floor, people walking, and sometime at night when they have driven by, they have seen a light on. It has even been said that they could see posters hanging on the walls if they had get the right angle. There is reportedly more than one ghost here. There is a lady in old fashioned clothing. She has been seen by several people since the remodeling was done on this historical school. There is also a prescence that likes to listen to music. A substitute who didn't know the school was haunted had quite a time with that one! Every time she left the room the CD player or radio came on. And there is also a male ghost. Students have seen the “ghost man,” coming silently down the hall and turn into the boys restroom. Rumor is that several night custodians have transferred or quit rather than work the night shift at this school. This three story Queen Ann Bed and Breakfast has four residential ghost that haunt the house. They are extremely active, they have been heard talking, also they have been seen and they have been felt. Sometimes they will tap a guest on the shoulders, stroke the back of their hair, grab their waist, and pull on their clothing. They can be heard going up and down both staircases at all hours, one bedroom door will not stay closed at night, they give parties in one of the rooms downstairs, they take things from guest and owners, they whisper in the ears of the guests when they are in bed, and will also sit on the beds and shake them. One of the ghosts is believed to be Dr. McBride, that built the house, then there is a Victorian lady dressed all in white, she also appears at the Old Army Hospital across the street, and two children a boy and a girl. The Logan County Sheriff's Office and Jail have been in the same building since around 1898. Since then, many inmates have hung themselves, mainly in the kitchen, while others have been inside the jail cells. Even with the lights on, they never turn off, staff and inmates have heard odd noises once almost everyone has fallen asleep, and people have seen things appear in the cameras faced into the cells. Inside the kitchen, several trustees and inmates that took their own lives up until about the 50's. All of the deaths at the jail are on record. There have been reports of apparitions walking into the kitchen also a man hanging from a rope in the kitchen. Things also like to move by themselves, like the door would slam while workers where in there in there and then lock behind them. The wife of a janitor died from injuries sustained by falling down the basement steps. Speculation says she was pushed, but no one was ever charged for the crime. People have reported getting a strange feeling while in the basement. The school also has several boarded up rooms in the gym and an underground tunnel leading from the actual school building to the gym, that is full of ancient school equipment, several yards away. Creepy footsteps and strange laughter have often been heard there. Several years ago the place was turned into a pre-school, an extension of the nearby Wynnewood school system. The Governor’s Mansion was said to be a School for girls in the early 1930's through to the late 1940's but was later shut down for reasons still unknown. However the house is located right by an old Indian cemetery, which is said to be haunted by lost souls, the house is guarded by an eight-foot fence wrapped with barbedwire. It is said that strange things have happened to the people that have visited the Mansion, such as flashlights dying after they entered the gate, softening of the ground, even the playing of an old abandoned piano which played as soon as they stepped up onto the porch. Some even say the have spotted an old Indian playing the piano. The old high school is fixed up and now serves a different purpose, but when it was old and unused reports coming from people that went inside it say there was an underground pool and there were lockers down there. They say if you go down and open all the lockers and then leave the room you can hear them all slamming closed. Also there is reports of sighting of a little girl who was burned and killed when the building caught on fire. She always carried a little doll with her. The dool has been seen on the stairs always in the same spot and if the doll is moved it will return to the same place as before. There is also a flight of stairs in the building and if you stand there and watch them people have seen a young girl with a white dress and black long hair floating in front of you holding her doll. And last there is strange smells in the boys bathroom of the building and there is blood spots on the wall and also blood looks like it has been dripping from the ceiling as it looks like a mold spot on the ceiling but it is red. This is an old home built in 1898 on Indian Territory. Mrs. Foreman died in the home in 1968 and it was later made into a museum. Her caretaker (Presley) continued his chores at the home until his death in 1989. He would tell stories of how he could look up while doing yard work and see Mrs. Foreman standing in the doorway watching him. The house has many cold spots and an overall uneasy feeling. While touring this mansion many people have felt ghosts, some have seen the presence of Pawnee Bill, an image of him is also in an ominous effect on a painting on the second floor. An angry chill is felt in the Southern upper bedroom where the men played poker. May Lillie, Pawnee Bills wife, haunts her favorite chair near the front door, and some have seen their child who died young, playing with toys near the chair. This theatre is one of the oldest buildings in Ponca City. People have reported hearing footsteps when nobody else is present, seeing people who disappear quickly afterwards. In the basement, some people have reported hearing the beating of an Indian drum nearby. Also, there is a stain in the ceiling that closely resembles blood. People have made every effort to remove it: washing it, painting over it, etc. But it always comes back after a few days. Merchandise and clothes have been found on the floor the morning after employees have cleaned and closed the store. Strange noises are heard in the back rooms. The double doors in the back are heard flapping when customers leave the store. Some employees say they have seen a man wearing gray walk through the store then disappear. Rumor has it a man who had been shot broke into the building to hide. He had climbed up to the second story and bled to death there. Employees have nicknamed this ghost "Charlie" and are used to the strange and unexplained occurrences. Three fraternity brothers were killed in an accident in 1977 while they were building a theme float for homecoming. The scaffolding fell into a power line and electrocuted them. The house reportedly is haunted by strange sounds, things moving around, lights and sink taps turning off and on. Apparently the house mother's, who was there preparing for the school year, nephew had a bad encounter there while staying there at night, in which he claimed to see something. Numerous students have apparently been killed during homecoming float preparations and rumor is Alpha Gamma Rho had actually stopped making a homecoming float because of how many people had been killed over time. Mainly the deaths occur from scaffolding set too close to the power lines on Washington street. The old Indian cemetery in Tahlequah is a constant source of strange occurrences, sightings of apparitions, and just plain spooky feelings. Tahlequah is the capital of the Cherokee nation, in the foothills of the Ozark Mountains, and is where the sad trail of tears episode in American history finished up...where a quarter of the displaced Native Americans died on the forced march. 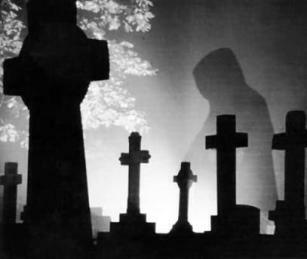 In the cemetery you immediately feel you are being observed, weird unfilled graves will appear and dissappear, sobbing and strange winds are common, and for some reason a dark man dressed in 1930's clothes will sometimes be seen...at times angry and giving chase to visitors at night. This is a very old hotel and it is said that Elvis once stayed in it. There are signs all over the place that say no trespassing or do not enter. It is usually at night, witnesses always see lights on and strange things going up to the very top floor and people looking through the windows. An office building, now vacant, on Yale Ave. in south Tulsa. A construction worker was supposedly killed during the construction of the building years earlier. A building engineer on the night shift and other "skeleton crew" workers reported hearing footsteps on vacant floors, or seeing a man in construction worker's gear, who never spoke, walking on the top floor and roof. One worker refused to go up on the roof after repeatedly hearing footsteps and finding no one there. At one point the building was supposed to be totally empty and the security guard, while making night rounds in the parking lot, observed someone walking around on the upper floors of the building. The Engineer also observed several strange things, including desk drawers in the cubicle next to his that would be found open again and again after he closed them. The sound of footsteps can be heard as well as voices when all is quiet. An old 1930's type writer up stairs has been known to type out messages during closing hours, and the lights have been known to turn on and off, even without electricity being supplied. Beads used to hang in the doorway to separate the kitchen from the dining room, and the owner says that one evening they separated and swayed back and forth, as though someone had walked through, but at the time, she was alone. The entire second floor is a chilling experience. This Hotel was bought in 1929 by Ann Eastman. She lived with her Daughter Lavern Eastman. When Ann died the hotel was passed down to Lavern. When she got old a preacher used to beat her. He wouldn't let anyone in to see her or let her out. Also upstairs on the 3rd floor in the last room there was a fire where a Baby died and the guy that let people in there rooms at night died trying to save the baby. Late at night you can hear a baby crying upstairs and a man yelling. Downstairs you can hear keys jingling from the doorman and whistling from Lavern. The owner has been seen in the front lobby walking around and hovering over tables. Curtains that were undone the day before are tied back the next as if someone was looking out them. Around the 1920's, A man named Hoffman took several boys into his home. Hoffman later went into a rage and killed all of the boys and then took his own life. The boys and Hoffman are buried in a cemetery on the property. Several instances of hearing someone running through the woods, voices, and footsteps in the mansion. The Mansion was condemned and bulldozed late 1998. The cemetery remains as well as some haunting spirits. This location was once a booming hotel, but was turned into a museum during the past century. Though several of the exhibits are strange, if not creepy, the location has a reputation all its own. Anyone who possesses the courage to pass through this museum alone will see strange things. Shadows pass where they shouldn't. Mannequins that are not animated move. Since the hotel was once highly populated, there is no way to keep track of the murders and other dramatic happenings that occurred here...but it is obvious that something happened. See for yourself.